Food Costs > How Much Does Halibut Cost? How Much Does Halibut Cost? Halibut is a flatfish that is part of the flounder family and is generally found in the northern Pacific and northern Atlantic ocean. Although these fish average 20 to 30 pounds, the largest one ever recorded was 734 pounds, making it the largest of all saltwater flatfish. The halibut can also grow up to eight feet long. 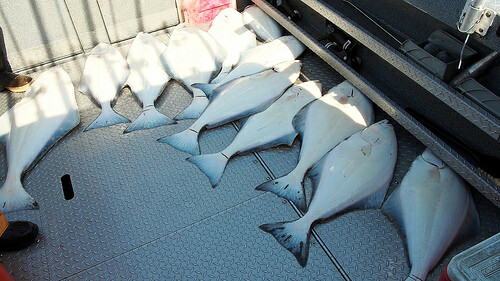 Because of its taste, halibut is highly regarded in countries such as the United States and Russia. At a local fish market where the fish is caught daily, the price is going to range anywhere from $12 to as much as $21 per pound, depending on the season, the cut, the demand and geographical location. Online seafood retailers could be double the cost. Omaha Steaks, for example, sells a package of 12 six-ounce filets for $99 to $170. These halibut steaks are pressurized and packaged for shipping. Other seafood retailers may sell cheeks for about $20 to $26 per pound and smoked fillets for $30 to $40 per pound. The whole halibut, without any work done to it, can be within that $12 to $21+ per pound range. For instance, FreshSeafood.com sells its 25-pound whole halibut for about $18 per pound. Forum members on Chow.com say they routinely pay around $20 per pound and anything over $30 per pound seems to be excessive. Most fresh fish markets may filet the fish and bag and wrap it to make sure it stays fresh. Some markets may sell the fish as a whole, allowing you to do the filleting. Most online seafood markets will fillet, debone and vacuum seal to preserve the freshness. On the market, you will often find halibut cheeks, fillets, steaks or the fish as a whole. Cheeks tend to be the most flavorful part of the fish and will be very tender. Fillets will have a milder taste and flaky texture. This tends to be the most popular option among most who cook it. Steaks will also have a mild taste and flaky texture, but it will have a smokier flavor if cooked properly. 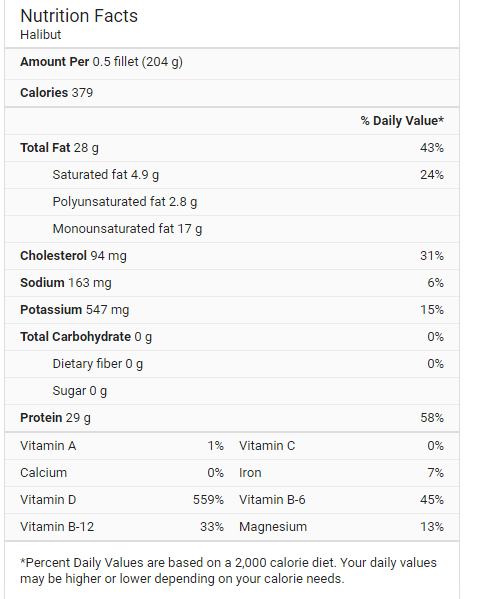 Halibut is low in sodium, it has no sugar and low in saturated fat. It’s high in magnesium, niacin, phosphorus, potassium, selenium, vitamin B6 and B12. A half of fillet will have about 380 calories. The halibut taste is mild and sweet. It tends to be lean, flaky and is best if purchased fresh from May to September. Where to buy halibut? Depending on where you live, it can be purchased via online seafood retailers, local seafood markets, wholesale clubs or grocery store chains. Shipping fees may apply with some online retailers since it has to be at your door within 24 hours. Some sellers will prep the fish for easy cooking. If you want a fillet that is already seasoned and ready to throw in the oven, it may cost 10 to 30 percent more. Common ways to cook halibut include baking, broiling, deep frying, grilling and pan frying. For those who want to catch halibut, common baits that are used include herring, guts, octopus, and crabs. Halibut prefer deep waters up to 300 feet deep and tend to hang around ledges and rocks. Halibut stores for up to three days in a refrigerator. If you plan on keeping it longer than three days, it’s best to store in a freezer. Halibut in a freezer can last up to six months. If you choose to freeze your halibut, wrap the vacuum sealed fish in aluminum foil and place it in a freezer bag for extra protection. As a rule of thumb, if purchasing whole, one pound of fish should be able to feed one person. Is halibut kosher? Once the skin is removed, it’s next to impossible to identify, and therefore, it can’t be considered to be kosher. Preheat the oven to 350 degrees. Arrange the fillets in a well-oiled baking dish and wait for a slightly brown texture. Preheat the broiler and cut the halibut into pieces. Baste with butter, top with bread crumbs and place in the broiling pan. Allow it to broil for 15 minutes until the flakes come apart easily with a fork. Dip pieces into milk or egg, then roll into flower. Heat the frying pan until hot and carefully place pieces into skillet until a golden brown. Place fish in 190-degree water and cover. Do not boil the fish and wait until the desired doneness. Try to purchase your fish locally. Not only will the fish be fresh, but you won’t have to worry about shipping fees. Consider the peak season during May to September when there isn’t as much of a demand. Local fish market out here charged $24 per pound.